Facebook, Twitter, and Foursquare – these three social media sites are flying high in colors for having so many users day after day. Whether you’re mad for Twitter, cautious with Facebook or addicted to Foursquare, these sites can help in one way or another. Let’s face it. Not everyone is witty and creative enough to come up with a one liner that can spike up curiosity from its readers. Fret not because this website generates random ideas that will definitely give your next status update a second read. For the ‘imaginatively challenged’ folks, go to Generatus and keep those likes and retweets coming. Want to be in the know of what’s trending worldwide and immediately see the feed of tweets coming in? The Top Twitter Trends site shows the top 10 most popular Twitter hashtags in the world in real-time. Visiting the site may solve your curiosity to know what people are actually tweeting, which makes the hashtag trend. The hottest links of Twitter all posted in one website. These are actually the stories people are currently sharing and linking to. Topics are divided into categories, which makes it easier to browse and retweet. By being active on this website, you would seem to always be updated of everything. 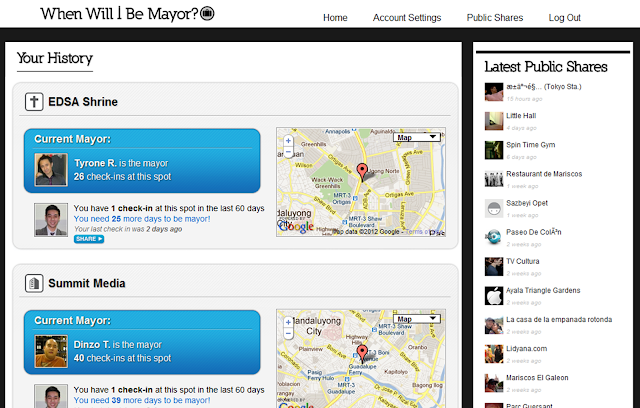 For Foursquare users who are so much into fulfilling their virtual dream to be a mayor of a certain venue, this website can help you make it into a reality. The site basically searches for your Foursquare history to find out how many more times you need to check-in before getting that coveted Mayorship. Tired reading your network’s status updates, links, and photos? Head on to this website to get to know more about the developments on latest Facebook features. It also has a good mix of how-to guides, tips on how to enable and disable certain configurations, as well as other interesting trivia about Facebook. If you’re sick and tired of Facebook, the SickFacebook site will be your best friend. It keeps a number of anti-Facebook blog posts, which talk about all the negative and annoying things about Zuckerberg’s creation. On the other hand, those who are not really haters may still visit the site to read up on some darker aspects of Facebook. This web-based application is a great way to manage multiple social media sites in one. The advantage of using Hootsuite is that you no longer have to open several browser tabs or download a number of applications in order to log in and keep yourself updated with notifications. What’s more, it also allows the scheduling of messages (i.e. tweets and Facebook posts), which makes it very convenient. Good things always come to an end. If social media has taken its toll on you by giving fatigue, you might want to pull the plug and check Delete Your Account. The site is full of documentations on how to delete accounts in pretty much any social networking service available. That way, you can get your life back. This article is my 60th contribution to Manila Bulletin -- one of the Philippines' leading broadsheets -- published on February 13, 2012 (Monday) in the TechNews Section. You can view the PDF version here (lower left portion).